After years of successful LGBT efforts -- especially last year's watershed for the transgender community -- brands are working on authentic ways to be more inclusive of the latter, but legal issues can still provide barriers. Advocacy group Stonewall recently created a transgender advisory committee. The year 2015 may go down as an icebreaker for the visibility of transgender people in media. Transparent — Amazon’s hit about a patriarch who transitioned to matriarch — became a buzzed-about cultural phenomenon. The Danish Girl scored four Academy Award nominations for its take on an early 20th-century painter who underwent gender-confirmation surgery. And as an example of a real-life transgender face, Caitlyn Jenner received the Arthur Ashe Award for Courage to a standing ovation at the ESPY Awards, where she told the televised audience, "[This award is] not just about me. It’s about all of us accepting one another." Stephen Macias, SVP and LGBT national group practice lead at MWW, tells PRWeek, "Last year was just the beginning. Those images are exceptionally impactful for their ability to educate people around the world about the transgender community. We will start to see those images connecting into comms and marketing strategies as advertisers look to be inclusive of the transgender community. But we’re not there yet." Perhaps that’s because LGBT leaders on the agency and nonprofit side say the T has taken a backseat in the mainstream LGBT movement up to now. But following watershed victories — including the U.S. Supreme Court’s decision guaranteeing marriage rights for gay couples in June — they say that it is rapidly changing. Gay advocacy groups, for instance, are becoming more inclusive of the T. In fact, they now include campaigning for protections and rights of transgender people as a key part of their mission statement. Studies show transgender people experience higher rates of violence, harassment, and suicide than gays, lesbians, and bisexuals. In late 2014 the National Gay and Lesbian Task Force, the oldest gay rights organization in the U.S., reconfigured its name to the National LGBTQ Task Force. The nonprofit said it was "upping its game to deliver full LGBTQ freedom, justice, and equality." And in Europe, one of the largest LGBT advocacy groups recently added the T.
Jan Gooding, chair of Stonewall — founded in 1998 by 20 gay men and women including Lord of the Rings actor Ian McKellen — says, "It used to be that ­campaigning for gay rights and trans rights was done separately in Europe. The feeling was that you couldn’t lump the issues of sexuality and gender identity together because that would be too confusing to the public." But following consultation with the transgender community over 18 months, Stonewall unified the two groups last year, creating a transgender ­advisory group and appointing a transgender woman to its board. The organization is now lobbying the government on transgender protections and going into schools and workplaces to provide education. "We realized LGB and transgender people may have different issues, but they share the same story of discrimination and intolerance," explains Gooding. "And while we’re pleased with the progress we’ve made in terms of LGB rights, a lot of work still needs to be done for transgender people." Transgender people may be better represented in media and by advocacy groups than ever before, but how have Fortune 500 companies responded? How have they embraced the transgender customer? There are signs that brands are taking steps toward figuring out how to include the T in communications. That includes H&M sister brand & Other Stories, which launched an ad campaign with transgender models, and Google, which made a short film that celebrated a Missouri gym welcoming transgender people. Google premiered the ad during the ESPYs. At Cannes last year, Unilever debuted an ad ­featuring androgynous performers — for its ice-cream brand Magnum — set to a cover of Rihanna’s "Umbrella." While it’s not made clear that any of the individuals were transgender, one of them was Willam Belli, who both was a contestant on RuPaul’s Drag Race and portrayed a transgender woman on TV’s Nip/Tuck. The campaign included vignettes with some of the performers talking about blurring gender lines. Neil Gledhill, Magnum’s global marketing director, says, "The response to the Be True to Your Pleasure film has been overwhelmingly positive. Media in general is becoming more inclusive and fostering a greater understanding of all people and their individuality." Zandra Zuno, executive director and multicultural marketing practice lead at Golin, Magnum’s PR firm, adds that forward-thinking companies understand the rewards of aligning with the trans community. "We are living in an ever-more-multicultural mainstream and consumers want to see greater diversity reflected in marketing efforts," says Zuno. "But it’s no longer diversity for diversity’s sake. It’s about a move toward a greater understanding of shifting demographics and acknowledging diversity and multiculturalism as business imperatives." Ian Johnson, CEO of Out Now, an LGBT marketing specialist, says brands must move on from campaigns that rely on sentiment and push harder on more strategic marketing and innovative creative. "In 2015 there was too much reliance by brands on feel-good factors like #Lovewins. But #Lovesells? Not so much. Selling ‘LGBT people fall in love and have families’ as your key creative campaign concept is not a leading-edge strategy in 2016. The consumer is growing weary of this and the trick won’t work much longer," he adds. "Consumers are aware you want their money — now prove why you deserve it. Be creative, not safe." Beck Bailey is deputy director of employee engagement at the Human Rights Campaign Foundation — and an out transgender man — who focuses on helping America’s workplace become more LGBT inclusive. He says marketers that have had early success with transgender outreach walk the talk. Unilever earned a perfect score on the HRC Foundation’s 2015 Corporate Equality Index, a national benchmarking tool on corporate policies and practices pertinent to lesbian, gay, bisexual, and transgender employees. Bailey cites Johnson & Johnson — which hired 14-year-old transgender girl and YouTube star Jazz Jennings as one of the faces of its skincare line Clean & Clear — as another example of a company that has an excellent track record internally. "For a company to be really effective in marketing to the transgender community specifically, or the LGBT community broadly, is to make sure its own house is in order," says Bailey. "You want to be known as an inclusive employer before trying to market to the larger community." Jan Gooding isn’t just the chair of Stonewall — she’s also group brand director at Aviva, a U.K. multi-­national insurer. She agrees with Bailey that "you have to make sure your employees and customers are being taken care of first. Otherwise, any marcomms that address them will feel like tokenism." To date, the organization has created the Aviva Pride Network, which organizes social, charitable, and other events throughout the year. Gooding has also gotten back the results of a confidential survey that encouraged transgender employees to self-identify. "While we were a little uncomfortable at first about whether this is something we should be asking our staff," she says, "we were pleasantly surprised at how many people did identify as transgender." Gooding says the numbers will help the company build support for programs that create an inclusive working environment for transgender employees. Andrew Barratt, head of Ogilvy Pride, a network Ogilvy & Mather established to help clients harness the consumer spending power of LGBT individuals, notes that while companies may be accepting of transgender people, that doesn’t necessarily mean they understand them. "The first step for marketers and big brands is to look at the products that could be better tailored to them and recognize how they fit into a transgender person’s life," he says. "The second step would be to then communicate that brand or product in the right way — a place a lot of advertisers haven’t reached yet." Out Now’s Johnson stresses the need for original tailored research of target customers sourced from the widest possible representative consumer panel to be sure market facts inform strategies and tactics. "Brands need to first undertake specific research to accurately understand how the LGBT consumer market — including trans and bi customers — views their products, services, and brand proposition," says Johnson. "Relying on an agency’s LGBT team is a mistake, one that may seem cost-effective, but is almost certain to prove inaccurate as a representative marketing guide for insights and comms strategies." Last fall in Houston a city ordinance called HERO (Houston’s Equal Rights Ordinance) that would have protected residents from sexual orientation and gender identity discrimination was defeated. Observers say the anti-HERO effort succeeded by focusing on transphobic images of men in women’s restrooms. In one ad a voice-over says, "Any man at any time can enter a women’s bathroom simply by claiming to be a woman that day. If businesses tried to stop them, they would be fined. Protect women’s privacy. Prevent danger." PR pros say discrimination and marginalization are very much enshrined in U.S. laws that fail to give transgender people the same rights others enjoy. In Indiana transgender people were excluded from a proposal that would grant civil rights protections to gay, lesbian, and bisexual people. And in New York the state failed to pass the Gender Expression Non-Discrimination Act, which would have added transgender people to the state’s hate crime statutes. "A large amount of advertising and strategy around the transgender community will come after we achieve some legal protections. We have issues that are still making their way through legal channels," says Macias. 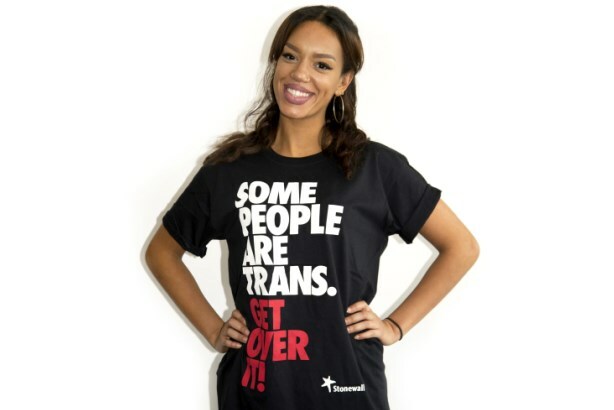 Barratt concurs that transphobia is the cause of hesitation for some brands looking to reflect trans­gender people in marcomms. But he also sees it as an opportunity, one he hopes more brands will take on, given their learnings from embracing LGBs. "Companies have an opportunity to make a strong political statement," he says. "At the same time they can also make a social statement about the importance of diversity and inclusion. They can be the conduit — bringing their brand message into the context of LGBT and pushing the human rights agenda forward. That can be a powerful message." When it comes to talking about the T in LGBT, numbers are not easy to come by. The U.S. Census Bureau doesn’t ask about gender identity, and although diversity surveys have started to, many respondents are reluctant to self-identify, says Stephen Macias, SVP, LGBT national group practice lead at MWW. "They may feel they are putting their job and housing — even their lives — at risk because they’re not legally protected," Macias explains. "But as they see more people like themselves reflected back at them in media and realize they’re not alone, they’ll say, ‘It’s time to stand up and be counted.’"
Beck Bailey, deputy director of employee engagement at the Human Rights Campaign Foundation, says the best studies put the number at somewhere between 0.5% and 1% of the population. That translates to between 1.6 million and 3.19 million people in the U.S.
"It will be interesting to see what happens to those numbers as public understanding of gender identity evolves," says Bailey. "We may see the size of that community grow as more people will have an expanded definition of transgender."